Eastern Randolph Co Fire Monitoring Equipment | F.F.A.M. Firefighters from Eastern Randolph County Fire Protection District receive training on the use of a gas detection monitor that was recently placed into service. Firefighters have a new tool at their disposal to improve service to local residents. The Eastern Randolph County Fire Protection District has placed into service new gas monitoring and detection equipment. 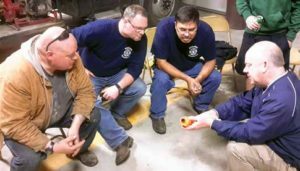 Firefighters from Eastern Randolph County Fire Protection District spent several hours training with the company that supplied the gas meter. “At the conclusion of the training we were able to place the meter into service and make it available for use the very next day,” said Chief Gaines. Funding for the purchase of the gas meter was provided through a grant from Enbridge Pipeline Company and the technical training was offered by Wise Safety and Environmental of St. Louis. “We appreciate our partnership with Enbridge and the support of Wise Safety is helping us to provide improved service to the residents that we serve,” said Chief Gaines. The Eastern Randolph County Fire Protection District services a portion of Randolph County east of Moberly to the Monroe County line. Volunteers that number close to a dozen and a half respond to various types of emergencies in the area and throughout Randolph County.